It's the first in the Toysmen Series and although it's new, it really seems to have the vintage toy fan in mind, and all vintage toy fans at that. 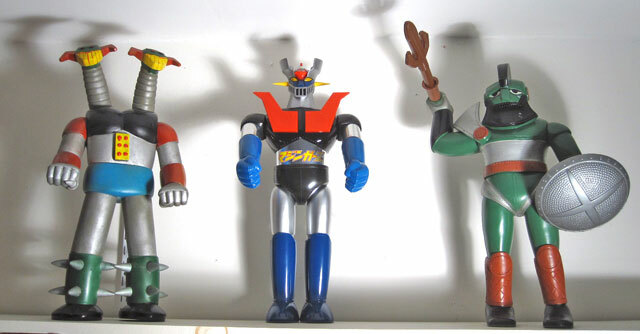 It is an absolutely beautiful combination of three of the most popular styles of vintage Japanese toys; chogokin, sofubi and jumbo. But first, let's take a look at the packaging. The outer box features original art of Mazinger Z shooting a rocket punch while the Hover Pilder is about to dock (or just lifted off). Is this even possible? It's been so long since I've seen the show I can't really remember. But who cares? It looks cool. Then there's a picture of a young boy holding the toy (in a pose not coincidentally reminiscent of Go Nagai holding the original jumbo prototype), which not only harkens back to vintage toy advertising, but if you have half a soul ought to remind you why we collect these things in the first place. But then in the background is a swimming pool with a bunch of people swimming in it. I suppose this is meant to represent the pool Z launches from but it seems like a weird image to put on a toy box. I'm not sure if I love it or hate it, to be honest. It's weird, but it kinda works in a...well, weird kind of way. If you don't like the front of the box, never fear. Not only is everything else about this a smashing success, but you can simply turn the box around and display the back side, which features a stunning combination of art and photography, with the toy image on the left and the internal mechanics of the character on the right, both in front of it's hangar base, while workers perform maintenance. It blends so seamlessly that I honestly had to double check to make sure that the photographed part wasn't painted art. This would make a great poster. 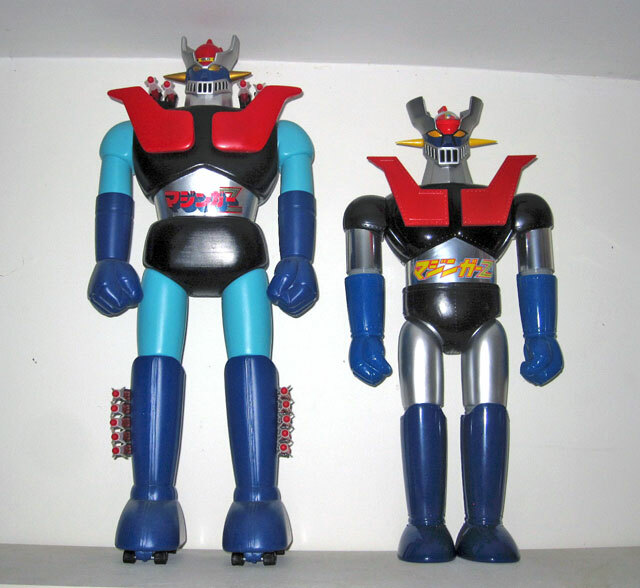 One side of the box shows the toy's features (which I'll touch on below) while the others show some of Mazinger Z's famous enemies, including Doublas M2, Garada K7 and Gelbros (Cerebrus) J3. When you open the box, you are greeted with that same hangar artwork minus the actual robot. Here's a quick rundown of what parts are what. The breast plates and fists are polyethylene. The legs, arms, pelvis and head are soft vinyl, the Hover Pilder is PVC and the chest is die-cast metal. Again, if you're a fan of almost any kind of vintage Japanese toy, this one has something for you. The Hover Pilder has folding wings and a molded in place Koji Kabuto in the cockpit. It has a magnet embedded in the plastic which attaches securely in the head cavity. Out of the box, Mazinger Z comes equipped with his famous Iron Cutter fists. Both arms feature a rocket punch mechanism though and extra standard fists are included. All feature the necessary firing pins to launch across the room. Because the firing mechanism is incorporated directly into the arms (rather than an accessory fist you need to swap out like the vintage toys), there is no articulation on the fists themselves. However, there are swivel joints at both the shoulders and the upper biceps so that you can raise and lower the arms, as well as turn them. Like vintage jumbos, the name is written on a sticker on the waist and there are also rivets molded into the vinyl. The toy also features an internal walking mechanism so that if you move one leg forward, the other moves backwards automatically and vice versa. I mentioned earlier the hangar art minus the character and you could probably have guessed that than you can display your toy in front of it. Even if it didn't have the features that it does, I would love this toy simply because it's beautiful to look at it. It has taken me way too long to write this review because I literally keep stopping to stare at this thing! Lastly, I love it because it seems to display better with my vintage villains than even the vintage jumbos do because it is closer in size and material. Here it is compared to the Unifive release of the character. For those interested in this, the cost is $350 plus shipping from Hong Kong. My friend is selling them for his friend and you can contact him at any of the places below. What a beauty! the amalgamation of materials and design ethos is breathtaking. Just one question, is the fit and finish as good as the pictures seem to indicate? Yeah, it's pretty amazing. I've never really heard of combining die-cast on top of vinyl so I guess only time will tell how well that holds up, but it seems like a really solid design so I don't anticipate any issues. Oh man I need this. This really is a gem. Also, I should mention that a Jet Scrander for this is also planned! I bought this based on your review and I couldn't be happier. Great toy, lots of play value. Bloody expensive but for jumbo collectors probably not a big deal. Thanks NekroDave! My pleasure! I'm really glad you enjoyed it as much as I did. Did you buy directly from my friend? I know some have been selling for high prices on Yahoo already so I hope you got it for retail.